There really are a lot of windmills! We drove 1100 kilometres yesterday! I drove it all. Jenn navigated superbly. It took us 12 and a half hours including stops. Thank-you, German autobahn, for helping us make up for the slower portions of rain, fog, twisting roads, traffic, and one wrong turn. Entering The Netherlands for the first time, we were given a memorable first impression: ponies. Little ponies, the kind that look like they're wearing leg-warmers. I think they're called flashdance ponies. 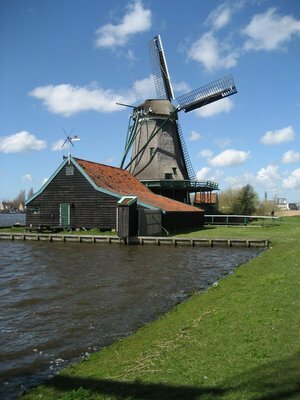 Soon, though, we were indeed seeing windmills (the old-fashioned kind), tulips and canals. The stereotypical images are for real, and not hard to find. Entering Amsterdam itself, driving alongside the canals, and the colourful, idiosyncratic houses, the impression was: what a pretty city. It really is a special place, and, for one night, we're staying right in the heart of it. Right near the Anne Frank house, and just down the street from the red light district (see what I mean, Jean?). Amsterdam is tremendously expensive for hotels, and our "budget" hotel is actually the single most expensive price we've paid per night on the entire trip! And what does that get you? Perhaps the single smallest room we've had on the entire trip. In a hotel without an elevator. Or parking. To be fair, it's there's nothing wrong with it, and they do include breakfast and free wireless, but, really, we just laughed as we climbed 50 plus vertiginous steps to our tiny room. Amsterdam is a unique city. Everything I imagined. It has as many canals and bridges as Venice, it seems, but in more orderly, concentric circles. The houses are all so distinct and colourful. We were wakened with bells from the nearby churches. After breakfast at a shared table with a mother and daughter from Canada, we headed right over to the Anne Frank house, just a couple of blocks from our hotel. Anica once again declared "this is my favourite museum." It is very well done, and very moving. Jenn and I had tears in our eyes right from the beginning. Her story proves Stalin's chilling maxim that "one death is a tragedy; a million deaths is a statistic." You really saw how they lived in hiding, including the meager decorations that Anne pasted to her walls. They have short videos to watch as you go through the house, mostly oral histories. You even walk through the same bookcase to the secret annex as that Frank family did. For lunch, we had Indonesian food. Anica seemed really excited about that, for some reason. We didn't go to Indonesia, but it's very similar to the Malaysian food we had. Then we called our friends, Fred and Irith, whom we met in Cambodia. We'd kept in touch since then (many months ago!) and they had extended a sincere offer to come stay with them when we got to Europe. And now it's actually happening, and we're having a great time! They're warm, generous people, and they did their own world trip. It was six months and they went to Malaysia, Vietnam, Thailand, Cambodia and New Zealand. So we had lots to talk about! Their two kids, Marisa and Igor, are just a little younger than Anica. Even though we have no Dutch, and the kids speak only a little English, they have fun, especially Anica and Marisa who are less than a year apart. 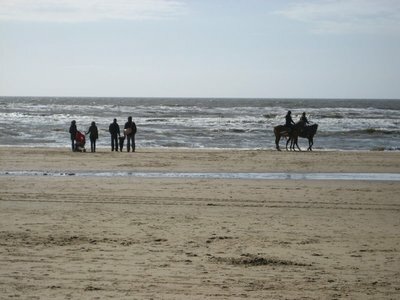 They live in Santpoort, about half an hour's drive from the centre of Amsterdam, on the coast of the North Sea. The first evening we arrived we got a feel for their area of Holland. We went up a windmill that was built in 1779. It's a working windmill, and we saw the flour they'd made that day. Then we went to "the dunes," a huge park of rolling, grassy sand dunes and gnarled trees. On the path we encountered the "wild" horses they'd introduced to the park, along with cattle, to naturally graze. When the sun was setting, we headed back to their house for a traditional Dutch meal. 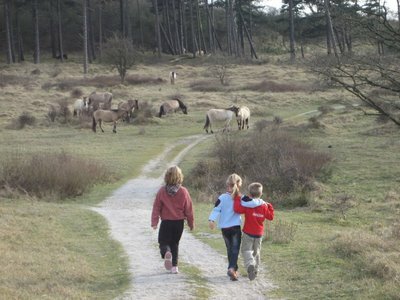 What a great introduction to their life in Holland! 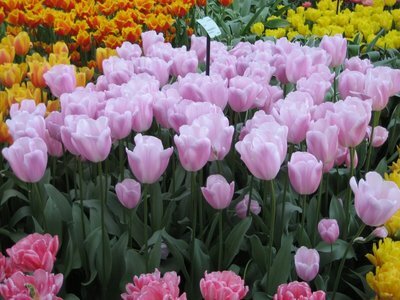 Like thousands of others, we headed to Keukenhof, the biggest display of tulips (and other flowers) in Holland. These gardens are huge!And of course, beautiful. Different companies create displays, and the grounds adopt a theme. This year's was China, so some of the gardens and sculptures reflected that. Anica probably saw the flowers as a colourful blur, because she was running around with Marisa and Igor, having a great time. There's even a big playground there for the kids. 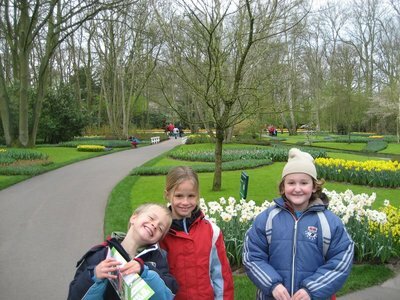 Jenn and I noticed that people "dress up" in traditional Dutch clothing to come to the Keukenhof. 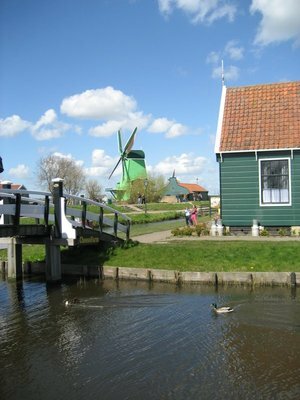 Then we went off to Zaans Schanns, which collects many traditional aspects of Dutch culture in a scenic spot that is not quite like one of our "pioneer villages." There are many windmills, but most of them still serve their purpose. There are quaint 17th century houses, but some are still lived in. Across the water, the houses look just as pretty, and they are all lived in. We also saw wooden shoe-making and cheese-making. Irith absolutely loves cheese, and we've been treated to some amazing cheese. As for the wooden shoes, yes, they did wear them as kids around the farms, and yes, they are quite comfortable - they're custom-made, after all. We also went to the beach, another part of the "dunes" part we were at yesterday. It was windswept, but sunny. We had pea soup and a glass of warmed wine at a restaurant overlooking the North Sea, then played a little on the beach. Typical Nord See beach scene? The town of Santpoort, like so much of what we've seen in the Netherlands, has bicycle lanes on every road. It also has a ton of sports and recreation options. One is the farm we visited this morning. Like the trend in Ontario, it's a semi-working farm, but mainly it's for visiting. The kids petted the animals, and climbed on the ropes and walked through the trails. Then we took the train to Amsterdam itself, and went on a canal tour by boat. Fred knows Amsterdam really well, and we mostly ignored the commentary and talked with them. After walking and taking the tram through more of Amsterdam, we went back to Saantport for another nice dinner and evening together. The "real world" of Monday morning work was calling them, and in the morning we said our goodbyes. One of the most incredible things about this world trip was the fact that we, a family from Canada, met a family in Cambodia, from the Netherlands, and made such a strong connection that we were able to stay with them months later and have a wonderful time. Our weekend in their home, seeing their part of Holland, will always be one of our most fondly-remembered times on the trip. Today we went to the Anne Frank house. It was my favrite museum so far, because it was really intrestng and had little bits of her diary and the wall. You watch movies (1-3 minutes aproxamitly) from Miep Gies or Otto Frank - they also had a copy of her diary! They also had a postcard that the Frank family sent. I also got a book called The Story of Anne Frank. We walked around town and bought me a top (at H&M) before having lunch at an Indonesien restaurant. Then we hopped in the car and went to Irith's and Fred's. I played with Marisa (pronounced Ma-ree-sa) before we went to the dunes we made a tree house at the bottom of a tree (the house was already made before we came) and we played. Had a lovely Dutch dinner, G.N. P.S. they're from the Netherlands so they don't speak every word of english - but, boy, they sure do know a lot! 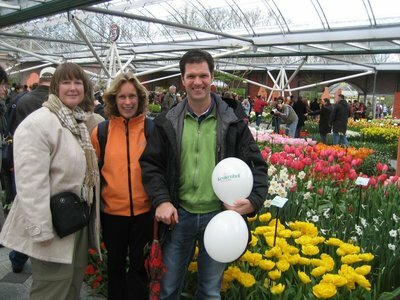 First, today, we went to the Keukenhof. That's a big flower garden in a town called Lisse. The main thing Marisa, Igor and I did was go to the playground. Otherwyes we just played with our ballons from the lady at the informatin center and looked at the flowers. 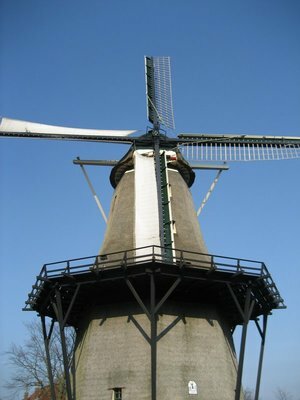 Then we went to a town where, first, this women took two pics of us, where Marisa, Igor and I went in a giant wooden shoe, played tag, and saw huge windmills. Then we went to the beach. While the Mums and Dads had hot wine, pea soup and bread, we gulped down our fries and ran outside to play. We made a sand castle/fort and played soccer with the Dads. Then we went home, Marisa, Igor and I played (Marisa and I played barbies, while Igor played with my plane and his other transports). Had Indonesian food for dinner, and, G.N.! Today first all of us went to a petting zoo. Actully it wasen't a petting zoo it was a farm. 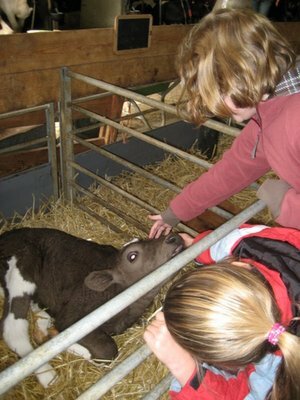 First we petted the cows (plus a baby who liked to lick Marisa). There was this one cow who snorted at us. Marisa and I backed off. Then there was the sheep. We petted babies for a bit (the baby sheeps) before a female one (not his/her mother) head butted him really hard cause she wanted atenntion too! Poor baby! It ran back to its mother. Before going back to the playground we petted the so cute, about two fingers long, baby bunnies! The coulers were black and brown. Then we played in the playground. We went to the train station (after droping Marisa off for a birthday party, so it was just Irith, Fred, Mum, Dad, Igor and I). 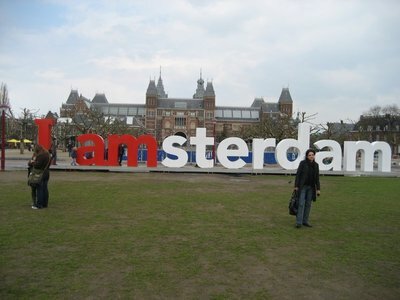 to go to Amsterdam. We went on a fun boat tour around Amsterdam. Then we went on the tram, went back, had a yummy dinner, G.N. !